Luckily I have the opportunity to serve in the Georgia legislature and create and push for policies that I believe will help Georgia continue to lead other states with respect to business friendliness. One of my projects leading up to the 2017 legislative session is to examine our private investment policy in Georgia and provide recommendations to stakeholders to strengthen our flow of private capital through the State. One of the important measures that Georgia took the lead on was its intrastate crowdfunding exemption. The Invest Georgia Exemption, or IGE (2011), is an exemption to the 1933 federal Securities Act that allows Georgia to create its own regulations around intrastate crowdfunding (not interstate–that’s across state lines).Georgia was one of the FIRST states to pass this intrastate exemption and now there are 31 other states that have passed similar regulations to make it easier to raise capital within a state. After taking a look at the states across the country, Georgia really is leading the states in intrastate offerings because of its raised cap, notice only 2 page filing requirement, a higher than normal cap on investment amounts and the fact that crowdfunding portals are not required in order to raise capital. This exemption cannot be used with any other exemption under the Rules or Act EXCEPT for officers or sales to certain people. That’s it. To date, Georgia has had 38 companies apply for the IGE Exemption. My Thoughts: I like that South Carolina, whom many would argue is our biggest rival with respect to business competition, has an unlimited raise cap so companies are not restricted to how much money they can raise. However, as many states have done, I would suggest making sure that GAAP are used and that the financial statements are independent reviewed and audited before taking the cap off IGE. The cap on investor contributions should remain the same under IGE and not go to the complicated percentage scale so many states use based on income and/or net worth. Let’s keep it simple. I am Dar’shun Kendrick, Private Securities Attorney and Owner of Kendrick Law Practice, helping businesses raise capital the LEGAL way. We work with “for profit” companies seeking to raise $250,000 or more through private securities (equity and/or debt) that have a line item budgeted for legal services. We do NOT find investors or introduce companies to investors; that is the job of “broker-dealers” and we are prohibited under federal securities law from doing so. I have 2 B.A.s from Oglethorpe University, a law degree from the University of Georgia and an M.B.A. from Kennesaw State University. I also serve as the ranking Democrat on the Georgia House Small Business Development and Job Creation Committee. View past and upcoming speaking engagements and request me to speak to your organization. NEW SERVICE OFFERING: Legal Opinions! You have an issue, we have an answer. For more information, click HERE for a sample legal opinion memo. If you have a gift to offer the world, it doesn’t need to be nicely wrapped. Just do it! Many of you have seen or heard my rants on Facebook, Twitter, Instagram,YouTube or anywhere else that I think I have an audience. And the rant is typically the same—-WHERE ARE ALL THE MINORITIES (WOMEN AND RACIAL MINORITIES) WHEN INVESTORS AND OTHERS ARE DISCUSSING PRIVATE CAPITAL? Many times, I look to my left—and my right—-and I am the only woman or person of color in the room or at the table (and if I am having a really depressing week—I’m the only one of for both). And this doesn’t make sense given the Business FAQs about Georgia (Georgia is #1 in the growth of women owned businesses and metro Atlanta is #1 in the US for black owned businesses) and the amount of private capital being infused into Georgia (see below). So I decided to develop a personal and professional pledge—the DK Pledge I call it—-as a constant reminder to myself why I must continue to break down the walls of access, education and communication between minority businesses and the world of private capital. But the pledge was not enough. You see, I am a woman of action—I’ve been raised that if I don’t like something, I don’t complain, I do something about it (which is probably why I was elected to the GA House of Representatives at age 27 but I digress). So I decided to start a non-profit with the FOCUS on “Educating and empowering minorities, especially women and racial minorities, on how to access private capital to grow their companies and create generational wealth.”I started with a small interest group in January and now we have a 8 member Board of Directors, approved by-laws, registration with the Secretary of State, and as of April 1, 2016 we are now a 501(c)(3) under the IRS Code with tax exempt status!—Just in time for our April 28th meeting which I hope you will join us in attending! And a SPECIAL shout out to the tax attorney that helped us to get it all done—Mr. Keith Miles. So…if you are a finance professional out there, minority or not, are you ready to help us in our mission to empower and educate minority entrepreneurs on how to obtain a piece of the almost $2 Trillion in private capital that has been invested over the last 10 years? If so, contact me and let me know. I am Dar’shun Kendrick, Private Securities Attorney and Owner of Kendrick Law Practice, helping businesses raise capital the LEGAL way. We work with “for profit” companies seeking to raise $250,000 or more through private securities (equity and/or debt) that have a line item budgeted for legal services. We do NOT find investors or introduce companies to investors; that is the job of “broker-dealers” and we are prohibited under federal securities law from doing so. I have 2 B.A.s from Oglethorpe University, a law degree from the University of Georgia and an M.B.A. from Kennesaw State University. View past and upcoming speaking engagements and request me to speak to your organization. Private Debt vs. Private Equity: Which one is right to fund your business? So you have made the decision that you need to raise vital private capital funds for your business to either start or grow—and you have struggled with which is best for your business, debt or equity? These 2 ways to finance your business have 2 different regulatory requirements, 2 sets of differences (good or bad), and look 2 different ways to potential investors or debtors. Figuring out with your team what is the best funding approach is vital to future progress and future fundraising efforts so it’s important to make the right decision from the beginning. NOTE: (1) This is NOT an exclusive list of advantages and disadvantages, (2) some disadvantages can be minimized by creative legal documents, and (3) you can always do a mix of debt and equity based on your funding strategy. This short post is meant to highlight a few thoughts for the budding entrepreneur. Liability on Balance Sheet. Debt, as you probably suspected, is just that: a liability for your company and on your balance sheet. If you are seeking a future round of financing, investors may be hesitant to invest in a company that has too much liability on its books. 1st Priority in Liquidation. In the case of a liquidation or merger, debt holders will be the FIRST to be paid before preferred stock holders and before common stock holders, which are usually the founders. So if you are a founder holding common stock, there are 2 layers of stakeholders that will be paid before you do. Less investor incentive. For investors that are contributing debt to your company, there may be less incentive to work as hard to grow the business than if the investor was a equity holder. Remember, debt holders are first in priority to receive funds in the case of a liquidation anyway so they have less incentive to grow the business. Cash drain on business. Since debt is essentially going to be a loan, it is going to be treated like every other loan. There are going to be monthly payments that the company has to make to the debt holder. For new companies that need cash to grow and re-invest in their business, this can be a severe drain of cash on a business that needs to use cash to fund or grow their business, especially new businesses. No equity in company. This is the most obvious advantage of issuing debt. When you are done paying the debt holder, you retain the same amount of equity in your business as when you first received funds from the investor. UNLESS you have a convertible note instrument that automatically converts the debt into stock at a preferred price upon the maturity date of the loan, equity is still given up but it is delayed. “Easier” to obtain. Easier is a subjective word but in theory, it’s easier for a company, especially a new company, to convince some investors to part ways with their money if they offer debt instead of equity for the reasons we stated above. Giving up some ownership. Obviously giving up some portion of your company is a hard and emotional decision but one that is required if you are seeking to raise private equity funds. It’s important to note that being a part of a successful business is always preferable to owning 100% of a failing business. More paperwork. Since there is a higher risk of the investors’ money with equity (since the investment is not guaranteed like debt) there is more paperwork that needs to be filed with government agencies and given to the investor when raising private equity funds. However note that “securities” is a broad term defined by the Securities & Exchange Commission (“S.E.C.”) so both debt and equity instruments will be regulated. More costly. For the reasons mentioned above, raising equity funds has more transaction costs. Additionally, there are numerous disclaimers and due diligence procedures that must be made based on the equity exemption the issuing company is raising funds under so your transaction costs, including attorneys fees, are higher. Naturally, since there is more risk that debt, the return on investment (ROI) required by investors will be higher in order for them to invest. You have to value your company. That’s the starting point for soliciting equity investors is to decide what your company is worth and what percentage of your company you are willing to part with at what price. There are legal documents that you can use to delay the valuation process to obtain a higher valuation in the future but they are not discussed here. No liability on balance sheets. While you still have to disclose other equity holders in your financial and corporate documents, equity doesn’t show up as a liability on your balance sheet, which is one of 4 financial documents you will need to prepare before raising capital. No cash drain. Equity holders only get paid when the company goes through an initial public offering (IPO) or merger. That means you can use cash coming into the business to make the business stronger and more profitable. It’s more fun. This may just be from my perspective but convincing an investor to buy into your business, really have skin in the game, and to reach your fundraising goal is much more exciting than debt. Investor knowledge and expertise. Most equity investors are interested in building a successful company and offer a wide variety of expertise and skills that debt holders (think banks) would not be willing to share. This is especially true if you use angel investor groups or venture capital (VC) funds. Well there you have it! A brief synopsis on the pros and cons of debt versus equity. It’s not an easy to decision to make whether a company seeks debt, equity or a combination of the two. That’s why it is VITALLY important that you compose and surround yourself with a team of experts that are passionate about your business succeeding and can weigh the options with you from an accounting, legal and business practical side of things. Best of luck to you and happy capital raising! NOTE: I will be discussing this subject in detail during our “Capital Chats” on Nov. 9th. I am Dar’shun Kendrick, Private Securities Attorney and Owner of Kendrick Law Practice, helping businesses raise capital the LEGAL way. We work with “for profit” companies seeking to raise $250,000 or more through private securities (equity and/or debt) that have a line item budgeted for legal services. We do NOT find investors or introduce companies to investors; that is the job of “broker-dealers” and we are prohibited under federal securities law from doing so. I have 2 B.A.s from Oglethorpe University, a law degree from the University of Georgia and an M.B.A. from Kennesaw State University. NOTE: I will be discussing this subject in detail during our “Capital Chats” on Nov. 9th. We are ONLY authorized to practice law in Georgia and therefore any legal advice in this blog only pertains to Georgia based businesses. Please visit us online to sign up for a time to discuss services or for our famous 10 point Business Legal Consultation for 1 hour. Whew! You have completed your strenuous capital raising campaign and now you have cash, you have a new set of partners, and you are ready to scale your business. Well—not so fast! Remember that there are still on going legal compliance measures that must be taken to ensure that you are operating legally for the sake of your business, stakeholders, yourself and your employees. REMEMBER, you can avoid having to worry about any of this by securing knowledgeable legal counsel to take that burden away from you. 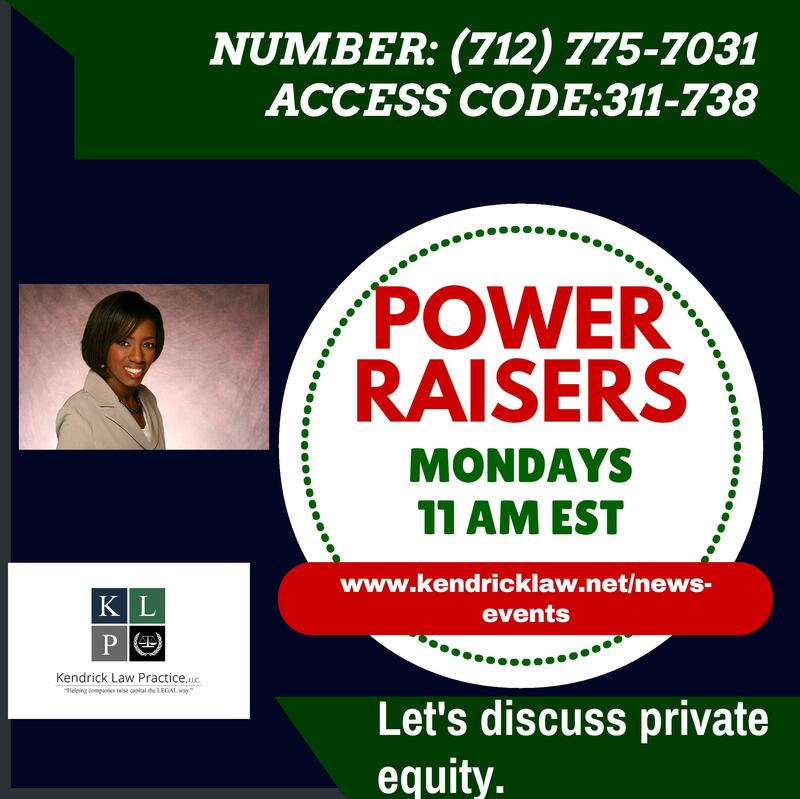 I am Dar’shun Kendrick, Private Equity Attorney and Owner of Kendrick Law Practice, helping businesses raise capital the LEGAL way. We work with “for profit” companies seeking to raise $250,000 or more through private equity that have a line item budgeted for legal services. I have 2 B.A.s from Oglethorpe University, a law degree from the University of Georgia and an M.B.A. from Kennesaw State University. NOTE: I will be discussing this subject in detail during my “Power Raisers” weekly conference call this Monday (Oct. 12th) at 11 am EST. Visit the News & Events section of my website for more information. One definition of venture capital (“VC”) is defined as “a type of equity financing that addresses the funding needs of entrepreneurial companies that for reasons of size, assets, and stage of development cannot seek capital from more traditional sources, such as public markets and banks.” (https://www.sba.gov/content/venture-capital, Sept. 2nd 2015) For companies that are pre-revenue or too early to obtain loans or go public, venture capital is a viable option depending on your industry, potential for growth and the amount of money you want to raise. However, venture capital is NOT for every business. Most venture capitalists seek significant control of your business from a management standpoint, such as a seat or more on your Board, and some will only look at high growth industries like tech and biotech to invest into, expecting high returns and to exit the business in less than 10 years. Below is a slideshare presentation I put together on the basic 9 VC deal terms you should know. Clearly this is not an exhaustive list as the attachments alone to VC investor agreements can be several pages long. But this should give you a general idea of what to expect from a VC deal. NOTE: I will be discussing this subject in detail during my “Power Raisers” weekly conference call this Monday (Sept. 21st) at 11 am EST. Visit the News & Events section of my website for more information. REMEMBER TO JOIN US WEEKLY…. To view past recordings and to see the upcoming schedule, visit http://www.kendricklaw. net/news-events for more information. ABOUT ATTORNEY KENDRICK & KLP  2 B.A.s (communications/political science)- Oglethorpe University  J.D./law degree- University of GA School of Law  M.B.A.- Kennesaw State  Oldest of 2 entrepreneurs  Life long learner  We work with companies seeking to raise $250,000 or more in private equity funds. DISCLAIMERS These are not ALL the terms you will see in a VC deal. Deal structures vary from deal to deal. Consult your legal counsel for more information. AND We do NOT find companies funding or investors.That violates securities law.We work with companies to complete their legal compliance associated with raising capital. WHAT IS “VENTURE CAPITAL”?  Is it money provided to seed, early money, or emerging companies.  A company would need venture capital if they are too small for an IPO (initial public offering) and haven’t gotten to the point where they could secure a bank loan (lack of financials or history, etc.)  Venture Capital Firms are private equity firms that provide “venture capital financing.”  In exchange, they usually want substantial control of the business operations.  In addition, you will find they demand a high rate of return typically in less than 5 years. TERM SHEET VS. STOCK PURCHASE AGREEMENT Term sheets create no obligation for theVC term to invest; the preliminary terms of the deal are outlined so that legal counsel can put in final Stock Purchase Agreement Vs. Stock Purchase Agreement is where the terms discussed will come into play. Once this is signed, the VC is obligated to abide by the terms in the agreement. TERM 1:TYPE OF SECURITY VC firms usually prefer a convertible preferred stock. “Convertible” because the stocks convert to common stock upon a triggering event, such as an IPO, and “preferred” because it gives theVC firms advantages over common stockholders. TERM 2: PRICING AND VALUATION This includes the heart of the deal:The money! The amount theVC will invest and number of shares issued to theVC of the company’s fully diluted stock ownership. Valuation = Price per share x no. of shares available for purchase. This will usually be outlined in the term sheet. TERM 3: FULL DISCLOSURE VC companies will want extremely detailed agreements and disclosure schedules that include covenants (“agreement to do something”) and restrictive covenants “agreement not to do something”) as well as warranties and representations about the company. TERM 4: LIQUIDATION AND DIVIDEND VC firms will include a term that entitles them to a predetermined amount of the company is ever liquidated. Because their stock is “preferred”, dividends must be issued to the VC firms before dividends can be issued to common stock holders. TERM 5: ANTIDILUTION CLAUSES VC firms want to protect the percentage of ownership in the business against future ownerships.Therefore, most VC stock purchase agreements will have anti-dilution clauses to make sure they retain the same percentage of ownership throughout subsequent rounds of financing. TERMS 6 & 7:VOTING & PREEMPTIVE RIGHTS Since their stock is “preferred”, VC firms will have significant voting rights, including but not limited to, voting for a seat on the company’s Board of Directors. Additionally, preemptive rights give the VC firms the right to purchase more stock in future rounds of financing. TERMS 8 & 9: MANAGEMENT NON-COMPETES & NON-DISCLOSURE AGREEMENTS VC firms want to make sure that the founds and management of the business they are investing in won’t steal trade secrets and ideas to start another business and so they required Non- competes from the company. A Non-Disclosure (NDA) term will be added to make sure confidential company information is not shared by the founders or management of the issuer/company. I am Dar’shun Kendrick, Private Equity Attorney and Owner of Kendrick Law Practice, helping businesses raise capital the LEGAL way. We work with “for profit” companies seeking to raise $250,000 or more through private equity that have a line item budgeted for legal services. I have 2 B.A.s from Oglethorpe University, a law degree from the University of Georgia and an M.B.A. from Kennesaw State University. NOTE: I will be discussing this subject in detail during my “Power Raisers” weekly conference call this Monday (Sept. 21st) at 11 am EST. Visit the News & Events section of my website for more information. A private placement memo (“PPM”) is the document that is given out to investors when companies (or “issuers”) are raising capital through a private placement offering or Regulation D offering. It is the equivalent of a prospectus that an issuer would file with the S.E.C. if the company was “going public” through an initial public offering or IPO. This document is not required to be filed with the Securities and Exchange Commission (“S.E.C.”) or given to investors. However, it is highly recommended to be given to be prepared to be given to be all investors and material information truthfully and fully disclosed. Why are PPMs so important? Because these documents are filed with the S.E.C., sometimes with a state agency over securities and distributed to potential investors, it’s important that the PPM be accurate and free of misrepresentations about the offering. Being honest and disclosing material information about the company, financials and the offering will prevent investor lawsuits in the future and from running afoul of any S.E.C. rules and regulations, as well as any state “blue sky” laws that may apply. Aside from the legal compliance and consequences of the PPM, this is the document that investors will consider THE document of the issuing company, giving details about the company and its plans for use of the funds raised. The document has to be both persuasive and honest, detailed yet somewhat pithy, and optimistic yet detail risks. Your management team, including and especially your attorney, will help you perfect this document before filing it with the S.E.C. or sharing it with investors. Elements of a PPM: What’s typically included. 1- Cover sheet. Usually this just tells that this is a private placement memorandum and the name of the company or issuer. 2- Overview. This details the number of shares the issuer will be offering, the minimum and maximum amount and the type of stock being issued, usually preferred stock. This is usually followed by some legal language detailing that investments are speculative and not guaranteed and that these shares have not been registered with the S.E.C. or a state agency. There is a detailed bar with the number of shares offered, price per share, commissions and proceeds to the company; each of these items will have important footnotes. This is a document with LEGAL consequences. Your whole management team should collaborate to make sure you have the BEST product when you submit this to the S.E.C. and to investors. Your attorney will be a vital part of this process and you should have one on your team in the very beginning as deadlines come with raising capital. There can be dire consequences if you miss the legal compliance of raising private equity. Be honest. Be thorough. Share with potential investors FREELY and EQUALLY. When in doubt, disclose. Don’t mislead. NOTE: I will be discussing this subject in detail during my “Power Raisers” weekly conference call this Monday (Aug. 31st) at 11 am EST. Visit the News & Events section of my website for more information. 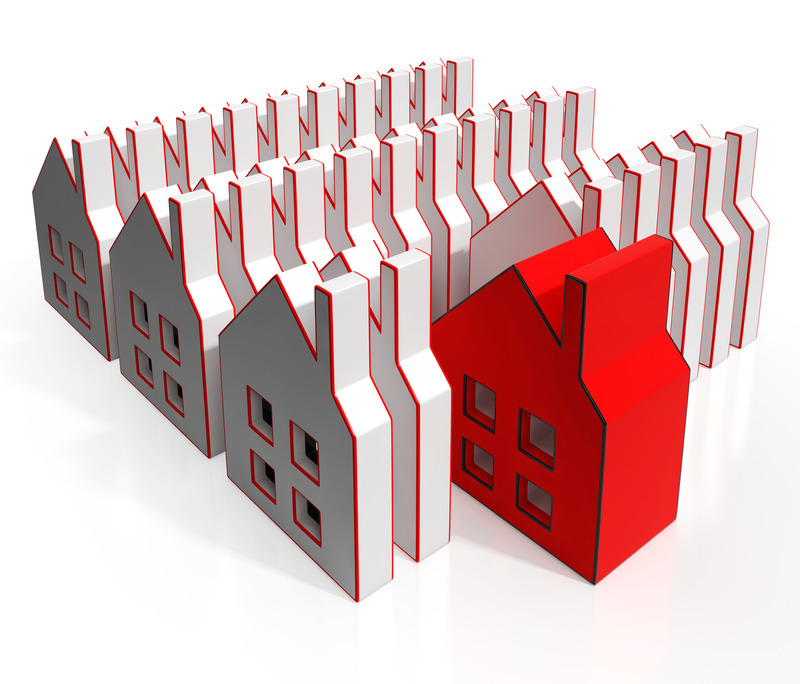 Crowdfunding in Real Estate: Is It the Land of Opportunity? If you have heard about crowdfunding, then you know that commercial real estate may be another HOT industry in this area of raising capital to invest in land projects. But how hot is it really? Are there investment opportunities? Where are they and how to they measure up? How do you invest? Is real estate crowdfunding really the “land of opportunity”? If you have read my previous blog posts, you know that crowdfunding is the relatively new way for companies (or individuals) to raise capital from a crowd of people, lowering the cost per unit for investment in a venture. In the real estate context, crowdfunding allows for non-institutional investors and real estate owners, operators and developers of commercial real estate to come together to meet the needs for capital of a specific or a group of real estate projects. This blog post specifically focuses on commercial real estate, as residential real estate has a different set of trends and rules and market considerations. Two things have happened to make real estate crowdfunding possible: (1) Technology and (2) the SEC’s recent change in policy embodied in Rule 506(c) which permits broad solicitation of investment opportunities to “accredited investors”. These 2 things change the game for those seeking real estate projects to invest in and for those looking for investments in their real estate projects. It makes the process easier, the solicitation easier and more accessible and there is the potential to pool more resources into a project at a faster pace. There seems to be two (2) approaches that real estate crowdfunding platforms have taken to funding real estate investments: (1) Companies will provide capital against their balance sheet and then create a derivative product that is marketed to investors or (2) Companies direct match pools of capital from investors with an investment once there is a sufficient amount of investors and monetary commitments have been made. Investors are then able to use an online dashboard to track their investments, almost like the ScottTrade or Etrade dashboards you may be familiar with to monitor stock market investments. Real estate is very personal, not like technology. Investors may need to physically see the property and that can cause a delay in capital raising or prevent an investor from investing at all. The crowdfunding market may be too small for institutional investors. If it’s not worth the time of institutional investors or the rate of return is not attractive, crowdfunding in real estate may stay a market just for non-institutional investors. Crowdfunding may be too slow. Loans can close in 14-21 days typically. But crowdfunding is dependent on the “crowd” needed to fully fund a project and can take 30 to 90 days for an investment to be finalized. If an investor is looking for a fast “flip”, crowdfunding may be too slow of a process. Debt deals through real estate crowdfunding has higher risk and, as expected, a higher rate of return with returns of 8-12% to investors. The typical stock portfolio has an 8% return. Platforms offer short term bridge loans for residential “fix and flip” projects and small commercial loans in the $1 to $5M range. There are a number of crowdfunding platforms that offer preferred equity products with returns of 10-14% range and even higher terms for more risky products. These deal sizes are usually in the $5-$25M range and require a minimum of 10% investment. So what is the future of real estate crowdfunding? It may just be a way for non-institutional investors to pool their money to invest in lower range commercial real estate. But we will discuss the future on our next Power Raisers call on Monday with Mr. John Jackson, whose job it is to analyze the commercial real estate market. NOTE: I will be discussing this subject in detail during my “Power Raisers” weekly conference call this Monday (Aug. 24th) at 11 am with special guest John Jackson, Real Estate Analysis. See flyer below or visit my News & Events section of my website.